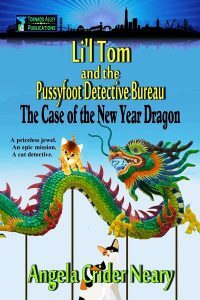 Li’l Tom, cat detective at the Pussyfoot Detective Bureau of Telegraph Hill, is back—this time, to solve the case of the New Year Dragon! Small animal deaths, art and jewel thefts, and a sinister, perhaps even supernatural, being lurking in the fog and shadows have been plaguing San Francisco and making the city’s four-legged residents afraid to venture out alone. Could these incidents be related? It’s up to Li’l Tom to find out. With the help of his sidekick, the lovely Calico cat, Lola, and several other unlikely animal assistants, Li’l Tom plunges into San Francisco’s Chinatown, Union Square, Russian Hill, and even the famous annual New Year Parade to crack the case. Along the way, improbable beasts and unhinged villains thwart his every move. Can he succeed in solving the case before it’s too late—before the Year of the Dragon is upon him?